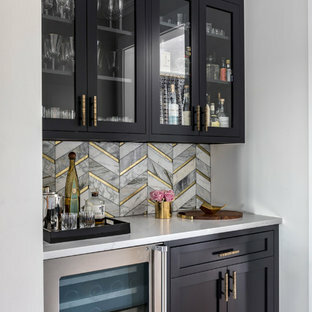 Whether you want inspiration for planning a small kitchen remodel or are building a designer kitchen from scratch, Houzz has 67,714 pictures from the best designers, decorators, and architects in the country, including Closet America and Sport Court of Washington, DC. 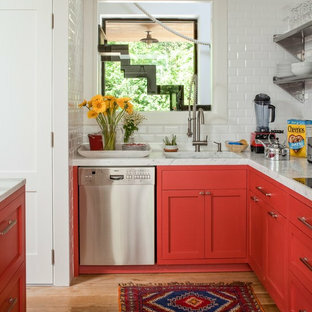 Look through small photos in different colors and styles and when you find a design that inspires you, save it to an Ideabook or contact the Pro who made it happen to see what kind of small kitchen design ideas they have for your home. 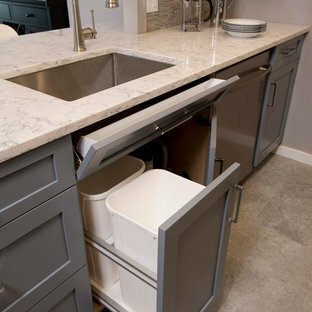 Explore the beautiful small kitchen ideas photo gallery and find out exactly why Houzz is the best experience for home renovation and design. This beautiful Birmingham, MI home had been renovated prior to our clients purchase, but the style and overall design was not a fit for their family. They really wanted to have a kitchen with a large “eat-in” island where their three growing children could gather, eat meals and enjoy time together. 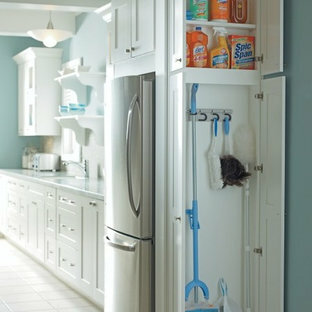 Additionally, they needed storage, lots of storage! We decided to create a completely new space. The original kitchen was a small “L” shaped workspace with the nook visible from the front entry. It was completely closed off to the large vaulted family room. Our team at MSDB re-designed and gutted the entire space. We removed the wall between the kitchen and family room and eliminated existing closet spaces and then added a small cantilevered addition toward the backyard. 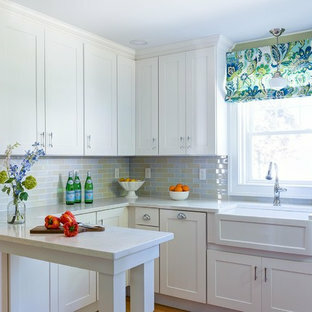 With the expanded open space, we were able to flip the kitchen into the old nook area and add an extra-large island. 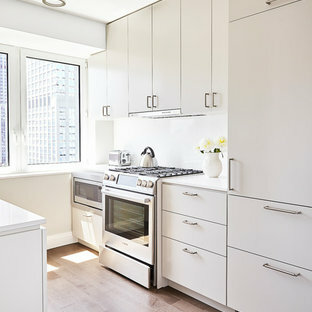 The new kitchen includes oversized built in Subzero refrigeration, a 48” Wolf dual fuel double oven range along with a large apron front sink overlooking the patio and a 2nd prep sink in the island. Additionally, we used hallway and closet storage to create a gorgeous walk-in pantry with beautiful frosted glass barn doors. As you slide the doors open the lights go on and you enter a completely new space with butcher block countertops for baking preparation and a coffee bar, subway tile backsplash and room for any kind of storage needed. The homeowners love the ability to display some of the wine they’ve purchased during their travels to Italy! 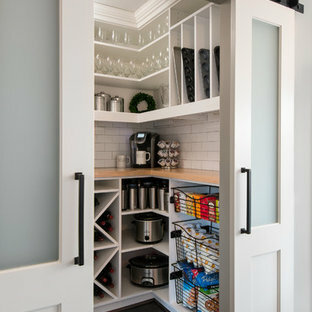 We did not stop with the kitchen; a small bar was added in the new nook area with additional refrigeration. A brand-new mud room was created between the nook and garage with 12” x 24”, easy to clean, porcelain gray tile floor. The finishing touches were the new custom living room fireplace with marble mosaic tile surround and marble hearth and stunning extra wide plank hand scraped oak flooring throughout the entire first floor. 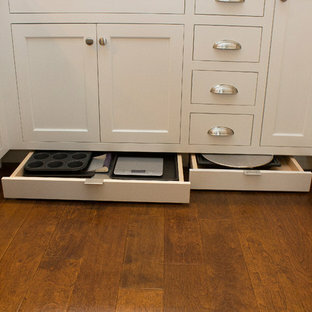 Pull out drawers create accessible storage solution in a tall pantry cabinet. By The Hammer & Nail, Inc. 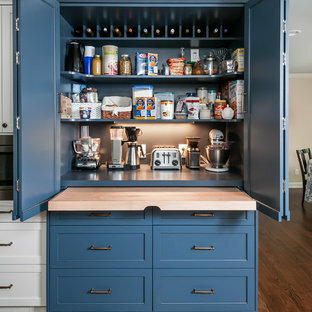 Custom coffee station that can vanish behind a cabinet by Wood-Mode.